To serve the needs of the local citizenry of South Blue Hill, several small general stores were established. Beginning in 1850, a store was built from lumber brought over from Long Island. Ben Sylvester took over the store in 1900. His son, Fred Sylvester, later took over the store and built a new one in 1917. It served 40 to 50 families on the neck and 10 on Long Island. The PO was in the store at that time. Other services like cutting hair, tending steamboats and butchering calves and repairing watches were provided. Most of the supplies came by steamboat and sailing vessels. Deliveries were made by horse and buggy. In addition, both Leon Sylvester and later, John Sylvester operated small general stores and gas stations. Since not many folks had automobiles until sometime after World War II, these stores provided a very valuable service to the community including entertainment in the form of sodas and ice cream cones with jimmies. In addition, the big general store in neighboring downtown Blue Hill (Merrill & Hinckley) made deliveries to folks in South Blue Hill. Paul Sylvester, Helen Sylvester and George Candage recall 6 – 8 markets in South Blue Hill. A pottery business owned and operated by Frank E. Day thrived in South Blue Hill turning out many useful household pottery items. Decorator H. Pauline Woods, made specialty items for Frank. Day used clay from local sources to fabricate his products. Seth Hodgdon sold lobsters near the South Blue Hill Wharf. He had one price for the summer people and a better one for the local folks. Albert Conary operated the Socony Mobil Gas Station and provided service to those folks who had automobiles or tractors that needed service and fuel. Conary also used his store as the Blue Hill Falls Post Office at Conary Cove. David Gray writes that the PO was located in various places. Ben Sylvester became the first Postmaster in 1896. Ben had new PO boxes built for the PO about 1917 and these were later taken to the new Falls PO in the home of Dolly Robertson, Postmistress. Anne Conroy founded the Fairwinds Florist business in South Blue Hill and ran it for many years before turning it over to Betty Stookey. The florist still exists and has moved to the big city of Blue Hill. Howard Morrison, Cressida Keefe’s grandfather, was the local fishmonger who sold to the residents of South Blue Hill and Blue Hill rusticators. He operated his business from (insert Cressida’s picture of her father by his truck) by driving each Saturday, year around, to Southwest Harbor on Mount Desert Island to buy fish directly from the boats. He and his daughter would pack the fish in boxes of ice and bring it back to South Blue Hill and Blue Hill. They sold flounder, cod, haddock (tongues & cheeks), halibut and swordfish. Howard’s wife picked crabmeat and sold it for $1 per pound. Paul Sylvester’s Hen House failed as a business but later became the center for New World Music (Noel Paul Stookey). The Hen House was cut in half and became the first home of local radio station WERU. One of the prized employment opportunities was to find work as a caretaker, cook, seamstress, child care provider, chambermaid or boatman for the “summer folks." Sometimes this work would continue into the winter months as well. Caretakers were treated with respect by their employers and usually received lovely presents in addition to their wages. In the early years there was a very strong class distinction and caretakers learned to “leave their feelings at the gate” when they entered the estates of the summer folks. One of the largest employers was the Palmer estate at the south end of Parker Point Rd. Walter “Doc” Woods and Hilda Pauline Woods worked on this estate for many years in the 1940’s to the mid 1950's. Bert Friend recalls cutting and fitting firewood in the winter and clearing blueberry land in the summer for landowners on the Neck. Bert Friend was one of the caretakers for the Becton family of Blue Hill. (Preface: In William Hinckley’s Bits of Local History there is a section on the Blue Hill schools. There were many of them, because children all had to walk to school – more info. available at GSA re: Blue Hill George Stevens Academy. According to Hinckley, there were two elementary school locations in South Blue Hill – one called the Blue Hill Falls District was west of the road near the head of Conary Cove and east of a small brook. A school building east of South Street on the hillside south of Bragdon brook was moved to this location in 1830. The schoolhouse burned in 1833 and another took its place. School was discontinued after the spring of 1908, but the building was kept in repair for some years after that. The second school he mentions is the South Blue Hill District School. (Rufus Candage says in his interview that the school was built in 1875 on one acre – a wood structure with a stone foundation 24’ x 38’.) 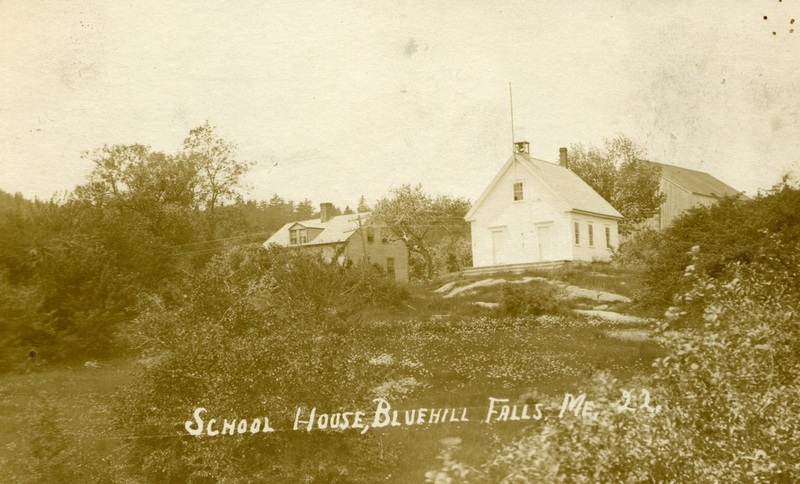 This school was west of the road and north of the South Blue Hill Cemetery. A playground was provided in 1921 with money appropriated by the town and was said to be the best playground at any school in town. (Location is near the current Dodd’s house). It was a one room school until it was enlarged to two rooms in time for the opening of the school in the fall of 1925. The school had two big rooms and perhaps 20 or more students. Many improvements were made with new teacher’s desks, chairs for kindergartners, a new stove and improvements to the out buildings. Total cost for the improvements were $1819.88. John Sylvester recalled being a janitor at the school for (3) years, earning $1 a week. His duties included arriving early to start a fire in the stove, sweeping the floor, splitting wood, carrying in drinking water from a neighbor’s well and shoveling snow in the winter. During the 1920’s, many of the young teachers were not much older than the students they taught. Students graduating from this school went on to either the high school in Brooklin or to George Stevens Academy in Blue Hill. By the 1940’s, the Blue Hill Consolidated School had been built and all of the elementary age children in the area went there. It was very modern with indoor plumbing and hot lunches provided. Also, Rufus Candage and Lillian Williams recall the first teacher as Imogene Bickford. Other teachers mentioned were Lucy Grindle and Sadie Billings. These teachers received $7 per week. Bert Friend recalls that when you went to school, the teachers were in charge and they laid down the law. Bert tells of misbehaving and having to stand in the corner wearing a dunce cap. He also tells a story of Louis Grindle getting caught for chewing tobacco in school – rather funny. Rufus and Lillian recall that kids were paid 75¢ per week to be the janitors of the school. The school had outdoor plumbing, one for boys and one for girls. Rufus recalls some boys lifting up the clean-out door on the girl’s side to sneak a peek. The teacher broke quite a few rulers on the hands of those boys. - Playing baseball in front of the school with the home plate and first being on one side of the road and the rest of the bases on the other side. - Sliding down Wharf Road in the winter. Also, walking across to Long Island as the bay was frozen. - Sylvester’s/Candage recall radios and listening to radio shows in the 1930’s. - Helen and Paul recall the practice of “Shivarees” for newlyweds. During the 1920s – 1950’s (accurate?) the Central Hall was leased to The Grange for their use. The Grange sponsored some well-loved Cowboy Shows with “real live” cowboys coming from as far away as Ellsworth and Bangor! Saturday night was “card night” where typically four to six couples played card games and had dessert. Couples included Katherine & Wallace York, Del & Alberta Seavey, Fred & Esther Astbury, H. Pauline & Doc Woods, Helen & Paul Sylvester and John & Anne Clough. Quieter forms of entertainment included listening to the radio many nights of the week – The Green Hornet, The Shadow, Inner Sanctum, FBI at Peace and War. Also, canoeing at the Reversing Falls was a major attraction as early as the 1950’s and later on, kayaking. It was not talked about much during Prohibition, but there was plenty of traffic in illegal liquor from Canada that came through the South Blue Hill wharf. Long Island was used as a depot. Old-timers tell stories of people they knew that warehoused the bottles in buildings and barns along the Falls Bridge Road. Also, in 1914, a building was erected on the Wharf for storage. This was occasionally used during Prohibition to store illegal whiskey. You didn’t go asking questions about what went on in those buildings unless you wanted to “take a bullet." Some of the “entrepreneurs” ended up spending some time away from their homes and families in government-provided housing. Being a coastal village, South Blue Hill was always watchful during the tense days of World War II. There was a tower erected near the South Blue Hill dock to provide a higher viewpoint for the warden to see down the bay to determine if any German submarines or enemy vessels might be making there way into our quiet community. Walter “Doc” Woods used it for many years as his workshop and now it resides near Cressida Keefe’s house. There are some wonderful recollections of blackouts that occurred regularly during the war and how the wardens enforced the blackouts. Frank Day, the local warden, would sound the siren down the Falls Bridge Road and the Wharf Road to let folks know that they needed to hang their blackout curtains. Army jeeps patrolled these roads as well and planes flew overhead constantly. It was a tense time for 4 – 5 years. Another example, it seems that Addie, an imposing woman, did not care for the blackouts that were frequently required and she would go out on her porch to walk. She carried a flashlight so she could see where the edge of the porch was. She would turn on the light periodically to check her location. This caught the attention of Frankie Day who approached the porch cautiously and called out “Halt!” Addie was surprised and shone her light directly on him to see who was making the fuss, thinking he might be a spy. He, in turn, thought that she might be sending some kind of signal to submarines off shore.) Jan Crofoot remembers running in the dark to the cellar and hiding under the ice chest during warnings. Fishermen were given cards with pictures of enemy ships to help them identify and report any suspicious activity. Even after the war, there was concern about lights being used to send signals. Elvie Ramsdell tells of sending Morse code messages via flashlight to her husband hunting on Long Island. The flashing light soon brought several cars to the South Blue Hill wharf to see if there was some kind of emergency that needed tended to.